This item comes with free shipping and insurance! 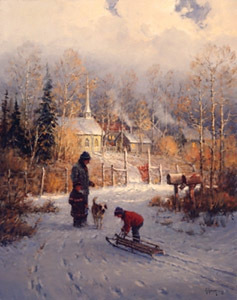 A Child's Hero is the 20th image in the Focus on the Family Collection and depicts a child with a sled accompanied by an adult, young girl and dog, all in a snowy landscape. The first snow has fallen, the sky is clearing, the sun has not quite set. It's the perfect time for the first sled ride of the season! Please note: Only artist proofs were available through the publisher. Signed and numbered edition prints were made available only through Focus on the Family as a gift for a donation. A Child's Hero copyright© 2005 by G. Harvey is prohibited from being copied. Web pages copyright© 1998-2018 by Christ-Centered Art. All Rights Reserved. 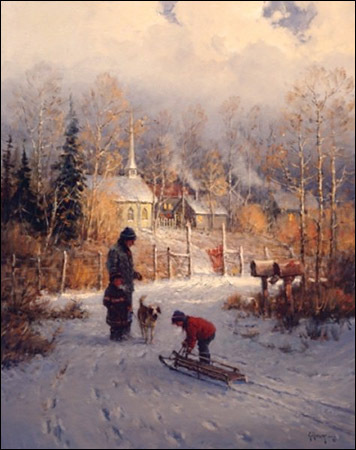 G. Harvey art, Focus on the Family, Christmas, snow, winter, church, artwork, art work, canvases, images, paintings, pictures, and prints of A Child's Hero by artist G. Harvey for sale. A Child's Hero painting by artist G. Harvey can be purchased in art print or canvas form at special sale prices at Christ-Centered Art.